Apple’s new major iPhone firmware update, iOS4, is officially live and ready for the release of the iPhone 4 as well as for iPhone 3GS, 3G, and iPod Touch owners to download now. iOS4 is available via iTunes (you will have to have the latest version, iTunes 9.2). If your iTunes is not providing you with the update, be patient, as some users have reported not being able to get latest firmware as of yet. iO4 brings a number of new features to iPhone including local notifications, iBooks, folders, an improved mail app, faces and places, home screen wallpapers, and, of course multitasking (although multitasking isn’t available to 3G and some iPod Touch users due to hardware limitations). If you want to check out a full list of features and learn more about the iPhone 4 and iOS4 update, you can head over to Apple. 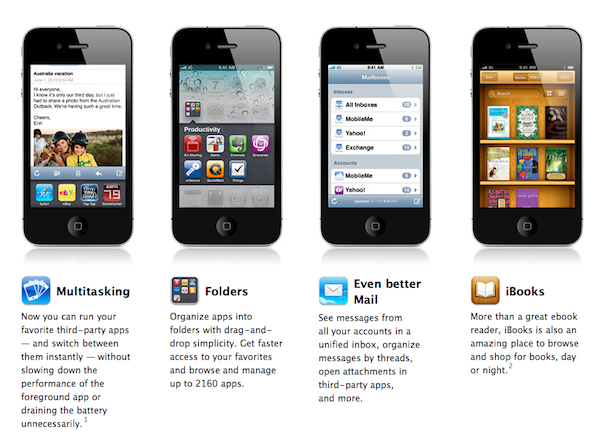 Have you downloaded iOS4 yet? We want to hear about your experience with Apple’s latest major firmware update.